Persol 649 - Cobalto Need Help? The persol 649S, created in 1957, became instant legend when Marcello Mastroianni wore them in the Pietro Germi film "Divorce Italian style". A favorite of Steve Mcqueen’s both on and off the screen. 1994's French book "qualita: scenes d'objects a l'italienne" declared it one of the objects most representative of the Italian genius of yesterday and today. This is truly a classic. Retro, timeless styling, distinct from all the “look a like” sunglasses made today, a definite head turner, and a piece that has a place in all sunglass collections. 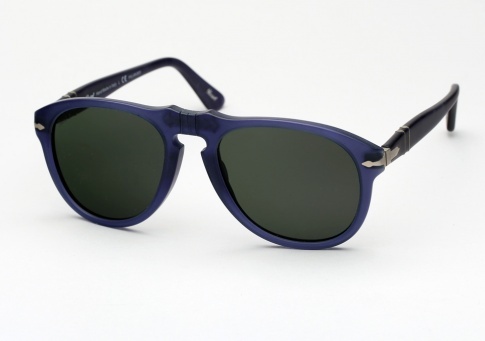 The 649 is a unisex frame, handmade in Italy, and offered here in Persol's “Cobalto” colorway; A cobalt acetate paired with G15(grey green) polarized lenses.